Labels: Au Ver A Soie, Kreinik, Mary Corbet, metallics, reviews, threads. You may have seen Mary Corbet's review of the metallic braid that Au Ver a Soie makes and been intrigued. I know I was! Luckily I got my hands on a spool of the Au Ver A Soie metallic courtesy of a friend who bought some from Ruth Schmuff's store. I don't know what other colors or sizes Ruth has as this isn't on her website yet, but you can check with the shop. I stitched with my Au Ver a Soie gold metallic in size 12 braid this week. It is a nice flexible thread, not stiff like Kreinik metallics. The end frays a bit as you work with it in the needle's eye. In the photo above you can see the fraying that happened as I handled it. If you cut it off the spool the cut ends don't fray until you handle it a bit or stitch with it. 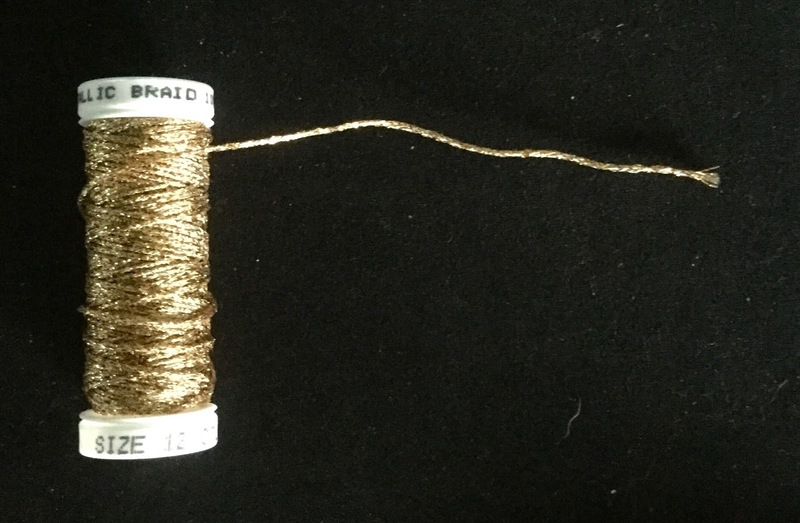 My spool is color 002 which is similar to Kreinik's Aztec Gold 202 or Citrine 3280; it is more brassy-gold than Kreinik's 002 gold. It's not a plyable thread--filaments can be pulled from Kreinik metallics if necessary but I don't think you can do so with the AVAS metallic braid--but it compresses. I compared it to Kreinik size 12 and it's a bit bigger in diameter—although a tad smaller than Kreinik's size 16. But it squeezes down as you stitch with it if you pull tightly. I tent stitched with the AVAS metallic on size 18 canvas next to tent stitches done with several colors of size 8 perle cotton. My gold tent stitches are only a tiny bit larger than my size 8 perle cotton ones. If you want to try this thread, besides Bedecked and Beadazzled, Needle in a Haystack in California carries this thread in a variety of colors and sizes. The shop also plans a club with a lot of colors later this year once Au Ver A Soie has plenty of colors stocked and available (second link below). The French Needle also carries several colors in size 4, 8 and 16. I can highly recommend Bedecked and Beadazzled and Needle in a Haystack, but I have heard The French Needle ships quickly and does good customer service as well. I just don't have personal experience with this shop. Is this going to replace Kreinik? No. 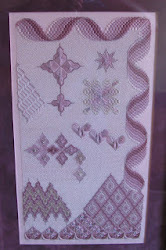 It doesn't have the color range that Kreinik has and right now it is limited in availability. 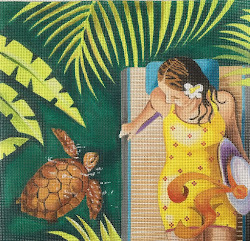 But if you are doing surface stitches or working on cloth instead of needlepoint canvas, it is a very good choice because it is much less stiff than Kreinik. For those who don't like the way Kreinik curls off the spool but who are hesitant to use a flat iron on their metallic, this is a good substitute. All in all, I think this is a great thread to add to our stash. Now I just need to finish up my current project and figure out how to use this on my next! 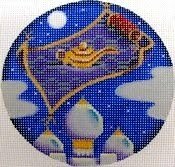 Nancy posted a photo on Facebook's Needlepoint Nation group of a perfume bottle decorated with petit point. One of her friends has an antique mall and has this for sale. It appears to be Austrian and is around one hundred years old. This is the first perfume bottle I've ever seen with needlepoint although the pink rose and blue small flower motif is common. © Copyright October 7, 2017 Jane M. Wood. All rights reserved.